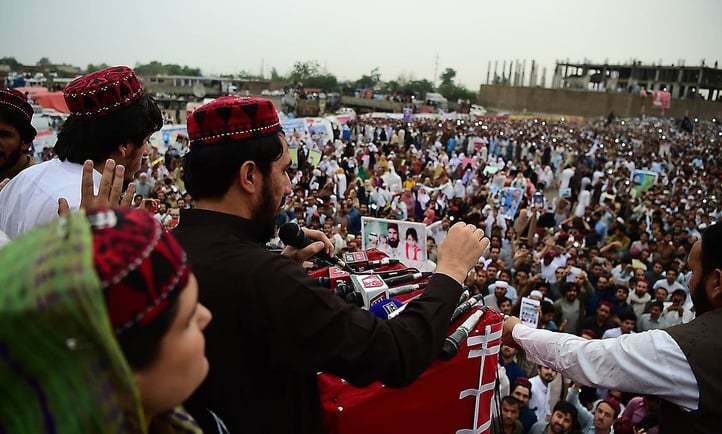 ISLAMABAD: Islamabad police have rounded up a number of Pashtun activists, mostly belonging to Pashtunkhwa Milli Awami Party (PkMAP), for holding an anti-Taliban protest this week. The protesters were gathered outside the National Press Club on the call of PkMAP chief Mehmood Khan Achakzai who had called upon party workers to hold protest in solidarity with Pashtun Tahafuz Movement (PTM) after it came under attack from pro-government Aman Committee in North Waziristan, which PTM calls “pro-government militia/ good Taliban”. 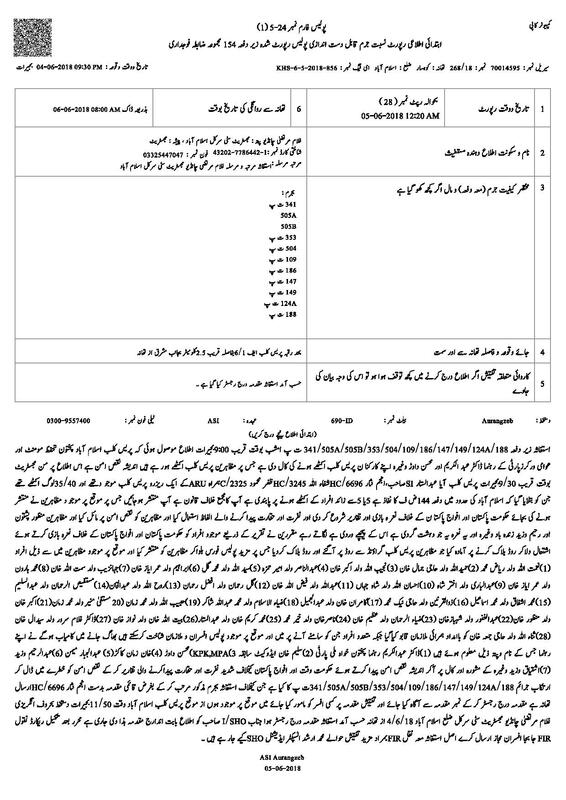 Here is list of 37 PTM activists sent on 14-day judicial remand to Adiala Jail. All r Uni students arrested 2 days ago when thy were protesting agnst Taliban attack on PTM in WANA. According to an activist, who was part of the protest, the police scuttled the demonstration at the outset by detaining three members who reached there before time. After them, two more were detained and that was the end of it, he claimed. The police claim the protesters raised “anti-army” slogans and disrupted the public order by blocking a road and instigating people. As news of arrest started making rounds on social media, would-be protesters dispersed before even reaching the venue, but police raided parks and nearby eateries to detain many more—37 in total, claimed the activist. The arrested demonstrators include students, PhD scholars, and medical doctors, he told Pakistan Today. However, police’s version turned out to be different. According to a police official, all protesters were detained from outside the press club for chanting “anti-state slogans” against state institutions. He said the accused were booked on “sedition charges” on the directives of city magistrate Ghulam Murtaza Chandio. He, however, hung up phone, saying he will talk after Iftar. But Pakistan Today couldn’t reach him after Iftar despite multiple attempts. The protesters were booked under sections 341, 505A, 505B, 353, 504, 109, 186, 147, 149, 124A, 188 of the Pakistan Penal Code after they refused to comply with police’s directives, the FIR, which lists 28 arrests, states. These demonstrators are being held at Adiala Jail in Rawalpindi after they were sent on a judicial remand. However, the activist, who seeks anonymity, claimed that they were not even presented before the magistrate; in fact, the magistrate even didn’t bother to attend to them. “The PTM activists were brought to F8 Kacheri in Islamabad. But instead of being presented to the magistrate they were made to sit in a prison van for three hours while the temperature was near 40C. After which they were taken to Adiala jail directly,” wrote a Twitter user on June 6. When asked about their treatment at the jail, the activist said they were not allowed to meet the detained activists. “We waited for four hours on Friday to see them, but the police refused us the meeting, saying court has barred them to meet the visitors,” he said, adding the police then changed their stance and said “we cannot allow you to meet them as they still have to go through the identification parade [a process in which accused are identified by officials present on the spot]”. “The demonstrators were being kept at B-Class; food is unhygienic; they are being tortured psychologically and they are not being provided with medical care either,” he further said. When asked how he knew these details, he said police had allowed a few Pashtun businessmen to meet some of the demonstrators after they approached a higher authority, who then told them these details. The police are skipping the court hearing besides barring our lawyers to meet them, he stated. “More delaying tactics in the case of the young PTM activists arrested from Islamabad. Yesterday the police didn’t submit its record, and today while the police brought the record the Prosecutor was missing documents,” read a Thursday’s tweet concerning these arrests. These arrests were conducted despite the fact that the Supreme Court had issued an order, barring police from arresting an accused without completing its investigation first. PTM and PkMAP have given calls for protests in solidarity with the detained activists. In a video message on Friday, Manzoor Pashteen warned that they will be forced to go to the United Nations if they are being “arrested, tortured and killed”.